Lord, today our prayers turn toward the 160 million people in the world who drink directly from rivers, lakes, ponds and irrigation canals. For those of us blessed with ready access to clean water, it is nearly unfathomable that about 1.8 million people die every year from easily preventable water-related diarrheal diseases--90% of them being children under 5. In order to avoid dehydration, these people face the risk of waterborne diseases every day. They become trapped in a cycle of dirty water, illness and poverty. Lord, please meet the needs of these people. Nurture gratitude in the hearts of those of us who use clean water every day almost without thought. 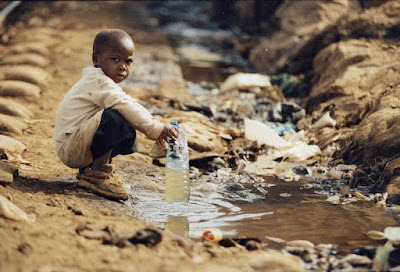 Compel us to meet the needs of those whose children die for lack of clean water. We thank you that this need is being met for more people each year. May that number continue to climb quickly. May we help everyone access this crucial element. Lord, we want to look out for our brothers and sisters around the world. Show us how. In Jesus’ name we pray, amen.